This year also marked a new partnership for Kestone and Career Launcher as the education initiative for Dell, the Aarambh programme, joined hands with Inquizitive Minds to promote the cause of spreading literacy and enabling the expansion of knowledge within the young minds of the nation. Dell Aarambh is a pan-India PC for Education initiative engineered to enhance learning using the power of technology. An astounding 9 lakh + students participated in this quiz contest and more than 15000 schools and 5000 colleges across 100 cities were engaged in this nationwide nerve wrecking challenge. Inquizitive Minds had also been conducted in Dubai this year touching thousands of young minds taking part in the quiz contest. The winners were awarded a cash prize worth INR 1 Lakhs, with the first and second runner-up's receiving a cash prize worth INR 50, 000 and INR 25, 000 respectively. 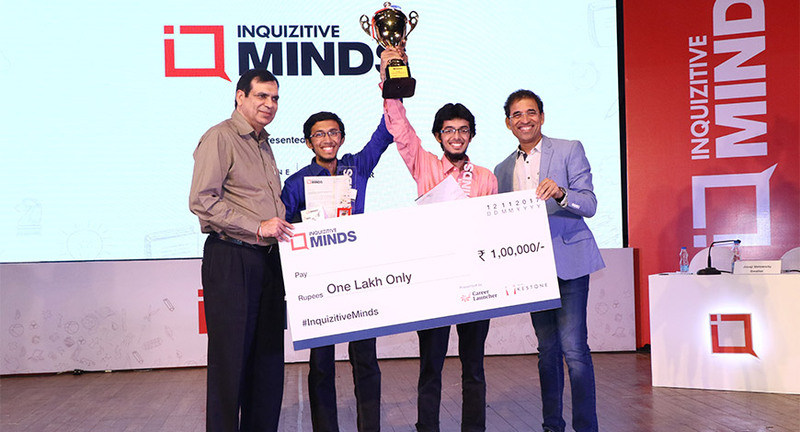 Overall, INR 10 Lakh worth of cash rewards were given to participants in this edition of InQuizitive Minds 2017. The proud winners of the school category, Laksh and Ananya, Sanskriti Public School, New Delhi shared their experience with InQuizitive Minds, "As students we are always on the lookout for different ways of learning which are fun and help expand our knowledge. Participating in a quiz platform like InQuizitive Minds which is planned on such a huge scale, helps us break up from the normal classroom routine. The journey of InQuizitive Minds was quite enthralling. We enjoyed being a part of it throughout the journey." Mustafa and Murfaz from Osmania Medical College, Hyderabad, who were announced winners in the College round were exhilarated and said, 'It was a tough competition. We thoroughly enjoyed the pace of the quiz and the way it was structured till the finals. Through quiz platforms like InQuizitive Minds, we get the opportunity to expand our knowledge on almost every subject and it was fun. This will help us in the other competitive exams too." While concluding the quiz, Piyush Gupta, President, Kestone, said, "While announcing the fifth edition of InQuizitive Minds, we were hopeful of receiving a huge turnout in terms of participations. And, we are elated after looking at the results this year. As an organization who is committed to youth marketing and innovation, we believe that the quiz culture in India needs a major revival and InQuizitive Minds is a testimony to this claim. We hope to grow even larger and better next year. " In the words of Gautam Puri, Vice Chairman & MD, CL Educate Ltd, "It was an absolute wonder to see all the young minds of our Inquizitive Minds 2017 coming together to take on such a huge challenge of knowledge. Truly, from my experience, if you can make education much more fun and interactive in a platform such as this, I believe we are looking at a brighter future for our nation in terms of acquiring and spreading knowledge. Inquizitive Minds is definitely making a mark in the sphere of quizzing and we are hoping to take this initiative to the next level in the coming years."